The Forza series is a tale of two different racing games. On the one hand, you have Forza Motorsport, the serious and sterile racing simulator. On the other, you have its Ecstasy-gobbling, Burning Man-attending hip racing cousin Forza Horizon. Apparently, Motorsport convinced Horizon to share some of its drugs, and the two have joined forces to give us Forza Horizon 2: a sprawling open-world racer that can be as arcadey or as sim-y as you want it to be, and is an excellent addition to the series. The Horizon Festival is a massive, summer-long music and automobile festival, and it's back again--this time it's hitting the French and Italian coasts before spilling into the sun-baked countryside. Thousands of hipsters with fancy cars and far too much disposable income have gathered here for a summer of concerts and racing competition; think Coachella meets Le Mans, and you're halfway there. It's a completely ludicrous set up that makes no sense under any form of scrutiny. Seriously, who would give these people free reign to terrorize not one, but two European countries with high-powered sports cars? I can't tell you how many private vineyards I must have demolished on my race to be Horizon champion, and it kills me a little inside every single time. Still, it at least gives you some context as to why you're driving around the Mediterranean coast like a bat out of hell. As contrived as the whole premise is, Forza Horizon 2's, well, horizons are gorgeous. 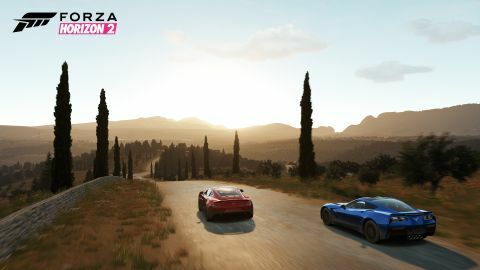 Whether you're racing down the winding streets of Nice or zipping through the bounding hills of Montellino, each location in Forza Horizon is both distinct and breathtaking. While there aren't as many cars here as there are in a typical Forza game, each one is painstakingly detailed, right down to the individual gauges and windshield wipers. The dynamic weather system ensures those wipers get fair use, too. One minute it's nice and sunny; the next, it's raining like the end of days, and how you tackle each course changes dramatically. It also looks fantastic, too, as rain bubbles and pools on the surfaces of roads and cars. Other than a few frame hiccups and some minor bouts of shadow pop-in, Forza Horizon 2's vistas are a joy to drive through, whether you're doing it in a classic Ferrari GTO or a not-so-classic 1981 Volkswagen Scirocco. You won't need to know a lot about about cars (other than that they look cool and go fast) to enjoy Forza Horizon 2, as it trades realism for pure, high-speed thrills. Cars may dent and windshields may shatter, but they ride just as well as if they were just driven off the lot, and each one is miraculously restored after each race. Driving on dirt or grassy fields will cause your vehicle to slide around more than it would on the road, but honestly, that just makes things even more fun, as you drift wide through someone's delicately pruned shrubberies. Heck, when the festival gives you your first ride, it doesn't show you each car's individual stats--rather, it's as if the game simply asks: "Which one looks the most badass to you?" Even the series' signature Rewind feature feels more at home here than it ever did in Motorsport, as it keeps you from having to repeat races due to a single botched turn. Forza Horizon 2 wants you in a car and doing awesome stuff as quickly and as often as possible, without having to worry about differentials and gear ratios. That is, unless you want to worry about that stuff, in which case Forza Horizon 2 has you covered there as well. You can poke around under the hood and change pretty much anything, from tuning different parts of your car to changing individual difficulty settings. That has long been a hallmark of the Motorsport games, but it’s new here in the more arcadey Horizon series. The cosmetic damage I mentioned earlier? You can switch over to realistic damage, meaning your car will stop dead in its tracks if it gets banged up too much--completely changing how you approach driving in the game. By taking advantage of these options, you can transform Horizon 2 from a simple arcade racer to a much more in depth simulation. It never feels truly necessary, though, and a vast majority of my time was spent without even touching any of these settings. Still, it's there if you want it, and it disappears almost completely if you don't care about anything other than going fast. In addition to the massive solo mode, Forza Horizon 2 includes an impressive online component. Compete in Road Trips or free roam across the entire map with several friends, picking and choosing races as you go. In addition to the typical races, you can also compete in Playground events, like Infected (ram into other cars as fast as you can to "infect" and turn them to your other side). While I wish the lines between online and off were a bit more blurred than they are here, if you're looking to test your driving mettle against the world's best racers, you won't be disappointed. Actually racing on each of Forza Horizon 2's many courses is a varied and exciting experience. Drivatars--the AI system introduced in Motorsport 5 that takes other players' racing data and puts it in your game--are back, and they seem to fit even better here than they did in the game that created them. Drivatars in Motorsport 5 are overly aggressive, to the point of constantly trying to ram into you, and it feels out of place in that game’s overly sterile environment. Not so here, as races in Horizon 2 are far more cutthroat and unpredictable, going from pavement, to off-road, and back again, with racers often leaving behind a wake of wooden fences and traffic cones. Earning skill points takes the insanity to a whole new level, as you're rewarded based on how well you drift around corners or how close you get to other drivers without crashing. Racing in Horizon 2 is a contact sport, and it's the most thrilling it's ever been in the series. In between championships, you can explore the massive open world of Southern Europe and take on a plethora of additional side content. It's makes for nice diversions, but much of it feels like just that--a diversion. Sure, you can seek out and destroy all 150 XP boards on the map, but there's really no incentive to do so, other than to say you did. Still, having this huge map to explore lets you be as focused or as distracted as you want to be, while always keeping you engaged in the act of driving. These delicate hunks of painted plywood are waiting to be run over with reckless abandon. Some feature the face of Horizon's smarmy host and an experience point award, while others will give you a small discount on fast travel costs. There are 150 of them, and many of them are well hidden--best get searchin'. There are speed cameras located all over France and Italy, and when you see one, you'll want to make your car go as fast as it possibly can--you know, the exact opposite of what you'd normally do… Right? Want to drive across France as fast as possible in a McLaren P1? Check out the Bucket List--a list of challenges that give you a specific car, a specific goal, and certain amount of time in which to complete it. Several abandoned barns are hidden across the French and Italian countryside, and inside each one is a rare, antique car. Sure, the cars are a bit beat up, but after a little TLC they'll be up and running in no time. And it's not stealing if their previous owners haven't touched them in decades, right? Every single racer with a name over it can be challenged to a one-on-one race at any time in between events. Each one varies in difficulty, with the most notorious racers paying out the most money for a win. Entering one of these locations will group you up with other online racers, let you look at their cars, challenge them to a race, or merely hang out for a chit chat. It's a great way to get to know the people you're going to destroy on the asphalt. After a while, though, Forza Horizon 2 starts running out of new tricks. Each championship in the game works like this: First, you go on a Road Trip to your destination--a timed jaunt that's less about racing and more about learning the lay of the land. Once there, you partake in four different races tied to your chosen championship. Once you finish those, you go on another road trip and do it all over again. For a while, you're constantly unlocking new features in between races, but once you start focusing in on knocking off wins to make it to the Horizon Finale, it starts to feel a bit repetitive. Still, it takes around 10 hours to get to a point where you're even starting to repeat races, and with 180 different championships, there's a ton to do. And when the core racing is this good, you won't mind a little repetition. Despite minor faults, it's easy to love Forza Horizon 2. With many of the optional features the more serious Motorsport games are known for, along with Horizon's high-octane thrills and massive open landscapes to explore, Forza Horizon 2 is a culmination of the best parts of both games, all in one package. Description Playground Studios returns (with some help from Forza creators Turn 10) with a sequel to the excellent Xbox 360 open-world racer Forza Horizon. Boasting a new southern-European setting, variable weather and Forza 5's Drivatar system, this should be awesome.